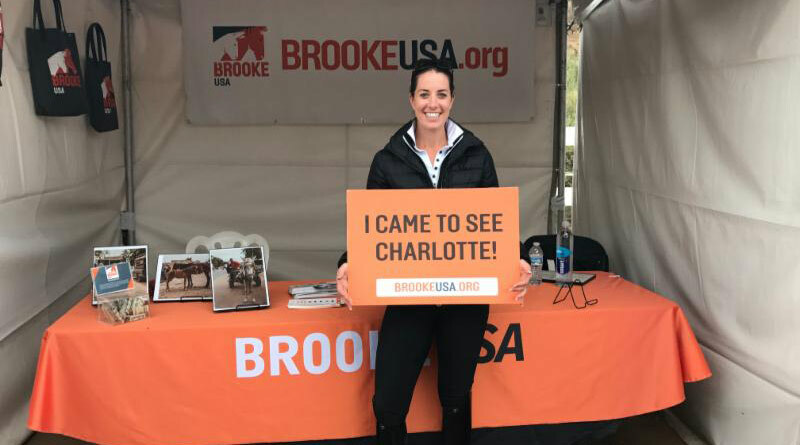 Brooke USA Global Ambassador and Olympic dressage gold medalist Charlotte Dujardin helped raise more than $10,000 at a dressage clinic last month. British dressage star Charlotte Dujardin has helped raise more than $10,000 for working equines around the globe. The Olympic dressage gold medalist and Brooke Global Ambassador raised the money for Brooke USA during a two-day clinic held at El Campeon Farms in Thousand Oaks, California, last month. A packed schedule of riders and a sold out VIP and auditor section made for a busy and exciting weekend at the clinic, and Brooke was Dujardin’s charity of choice for the event. Attendees came away from the clinic with new riding techniques taught by Dujardin, as well as a deeper understanding of the important work Brooke does around the world. Although she taught all weekend, Dujardin took the time to share with the attendees that she had spent six days in India last year to see some of the Brooke’s programmes. In India, there are an estimated 1.2 million working horses, donkeys and mules. Each working equine animal supports an average of six people, but many families who depend on working horses, donkeys and mules for a living face real problems rearing them. Animals often become sick because of a lack of proper food and clean water – their owners simply can’t afford to provide it – and difficult terrain and climate create a tough working environment. Dujardin saw several Brooke projects while in India (where Brooke has worked since 1992) including a women’s equine welfare group. Brooke frequently works with women in poor communities because they are often the main caregivers of the horses, donkeys and mules. She also traveled with Brooke to the Dewa equine fair near Lucknow. The fair runs for two weeks and thousands of horses, donkeys and mules are bought and sold during that time. At the fair she visited one of Brooke’s free veterinary clinics, used to treat the animals and to teach owners and traders about how to look after their animals. She saw several treatments, including dressing of wounds, injections for infections, and advice for better saddlery, harnessing and nutrition. Brooke USA staff working the booth at Charlotte Dujardin’s clinic in California. The sold-out clinic was hosted by SH Productions, which donated a VIP table and placed Brooke banners around the ring. SH Productions also hosted a raffle with items donated by Horse and Rider Boutique which raised a significant amount toward the $10,000 total. Brooke donor Kristina Tomalesky commissioned a charcoal drawing of a dressage horse and rider by UK wildlife and equestrian artist Heather Irvine, and Ransome and Laura Rombauer donated tote bags that also helped raise donations.